It should come as no surprise that Governor Bill Lee is pursuing an aggressive agenda of school privatization complete with a fast-growing voucher program, additional money for charter schools, and a way for charter operators to bypass the accountability of local school boards. Now, however, it seems Lee has enlisted co-conspirators from the school district likely to be most negatively impacted by his agenda. Senator Brian Kelsey and Rep. Mark White have agreed to carry Lee’s legislation creating a state charter authorizer. It’s a bill some critics are calling the worst charter legislation in the nation. 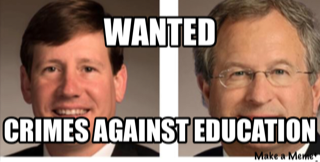 State Sen. Brian Kelsey, a Germantown Republican, and State Rep. Mark White, a Memphis Republican who chairs the House Education Committee, are carrying Senate Bill 796 and House Bill 940, one of the signature pieces of Gov. Bill Lee’s K-12 education initiative. White didn’t want to use the word “bypass” but acknowledged the legislation would remove the step for charter applicants to go to the Tennessee Board of Education if turned down by local boards. “But basically, yeah, you would come to the state without going through that process,” White said. If Governor Lee’s proposal is successful, schools like Rocketship will now be able to circumvent local input altogether. In this case, MNPS identified key problems with Rocketship and decided an expansion was not in the best interests of the students of the district. It’s not yet clear whether there is broad support for circumventing local school boards. The legislation did pass a hurdle today, clearing a House subcommittee and moving forward in the process. Your support makes publishing education news possible. This entry was posted in Bill Lee, Charters and tagged Mark White, State Charter Authorizer. Bookmark the permalink. Pingback: Owen4Schools « Pass the Bill and Figure it out Later? !